For all business and recreational aviation purposes, you can charter a private airplane from Dinard Airport. All the services offered at Dinard Airport are detailed in the Guide to charges that you can access via the Corporate section. At Dinard Airport, a number of clubs offer a range of air experiences: the chance to fly a plane for the first time, formal lessons and pleasure trips. The aeroclub's experienced pilots take care of everything so that your first time at the controls over the Emerald Coast is memorable and fun. The club also offers formal flying lessons. Fly over the Emerald Coast in a microlight: Aerodin operates a wide range of fixed-wing microlights, for trips or for learning how to fly. Emeraude offers pleasure flights, and also lets you plan your own flight, selecting the places of particular interest to you. With the controls in the hands of our professional pilots, you can sit back and enjoy the thrill of a trip in a small airplane. Open right through the year, the Emeraude microlight flying club offers taster and recreational flights, as well as formal lessons leading up to the award of a microlight license. ​Business or individual , contact Héliberté to offer an unforgettable memory in a helicopter for festivals, weddings, birthdays but also professional seminars. 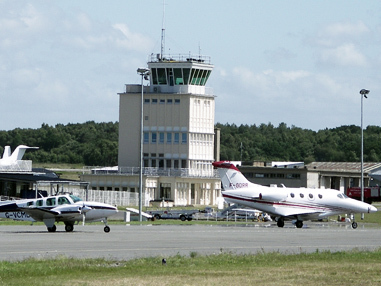 Dinard Airport is conveniently located near many touristiques places. Perfect starting point for exploring the Emerald Coast and enjoy the charm of Saint-Malo, Dinard and the Bay of Cancale it also allows to join fast the famous Mont-Saint-Michel. More information on Dinard and its surroundings here. The guide to airport charges lists all the charges applicable at Dinard Airport. It can be accessed via the Corporate section. Since 2014, August 1st, Dinard Airport offers a new package transit for €7 vat*. This includes landing and parking (up to 3 hours). It is a practical and economical solution for your business flights and flights leisure (more information on p.10 of the guide to charges less than 6 tons). * Applicable for aircraft no-based, less than 2 tons and for no-commercial flights only. Business or individual , contact Héliberté to offer an unforgettable helicopter during festivals, weddings, birthdays but also professional seminars .Business or individual , contact Héliberté to offer an unforgettable helicopter during festivals, weddings, birthdays but also professional seminars .